As marketers, it’s easy to turn up our nose at other marketers who send thoughtless emails, but we need to stay alert and make sure we’re not being lazy and becoming spammers ourselves. Lead nurturing is like cooking: done right, you delight your audience with the right food delivered at just the right time. Done wrong? Well, it’s spam and eggs. 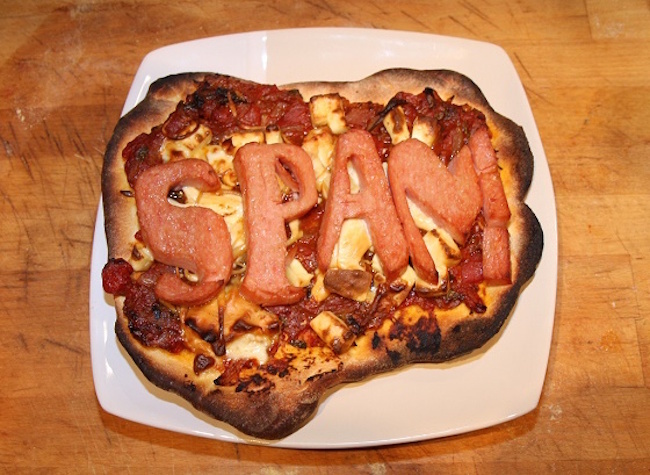 Spam looks bad for both emails and food. Image by Cookipedia via Flickr. Like cooking, lead nurturing doesn’t need to be original to be good. If you follow the right recipes and use the best ingredients, you’ll find your leads responding to your emails as though you were a five-star Michelin marketer… instead of that guy who re-heats taco meat at Taco Bell. 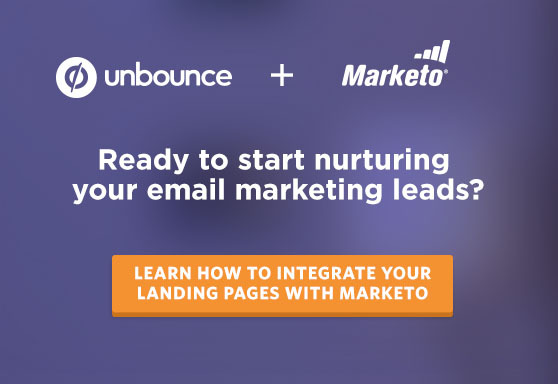 Here are four spam-free lead nurturing recipes you can use to send prospects organically down the funnel – toward that precious conversion. Are more interested in the industry or a common problem than in your specific offers. Like to read about relevant content as long as you trigger their curiosity. Don’t have an intent to buy immediately, or at least haven’t shown it yet. Don’t read everything, only what they care about. The goal of nurturing this kind of prospect is not a sales conversion. Instead, you should aim to become their main source of knowledge around the problem that plagues them. If a prospect can immediately tie a specific issue to your brand (for instance, if they see you as the leader in the PPC space), you’re halfway to converting them. A newsletter template that you can quickly and easily drop new content into each week (or every two weeks). Epic, original blog content: If your blog covers a wide variety of topics, let readers self-select what content they want to receive (like HubSpot does on their blog). That way, you can serve up fresh, hyper-relevant articles. HubSpot allows readers to self-select the blog content that is most relevant to them. In doing so, they are sure to serve up hyper-relevant content that prospects will love. Others’ content on the same topic: Don’t be a narcissist. Only showing your own content is blatant self-promotion. Showing others’ adds value and social proof and reduces the burden of creating more content. Andreessen Horowitz (a16z) is a venture capital firm who releases a weekly newsletter packed with insights for entrepreneurs. They’ve done a great job at positioning themselves as a go-to resource for entrepreneurship, rather than just another VC firm. 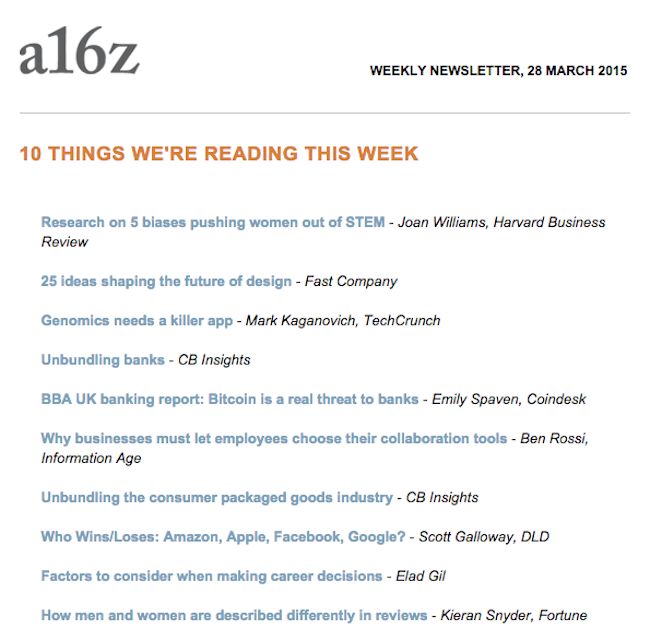 a16z‘s newsletter helps position them as thought leaders in the entrepreneurship space. The newsletter is one of my favorites because of its scalability in terms of content and topics, and its simplistic design. Remember that your newsletter isn’t a full-course meal, but a snack for prospects when they have five minutes and crave some bite-sized content. Are starting to research a specific problem and a specific tool to solve it. May have read about or used the products offered by your competitors. Only have a slight likelihood to buy immediately, but have shown some interest. These prospects are likely already familiar with you and your content, as well as that of your competitors. For this reason, it’s important that you demonstrate how what you have to offer is unique — and better. One way to differentiate yourself at this stage is by focusing on building trust while your competitors are trying to sell something. The end goal is to continue to deliver value and segment leads so you can serve up more relevant content — and eventually, relevant offers. A simple way to continue to deliver awesome content is with an email course that speaks to your prospect’s specific pain point and educates them about your solution. Your course should cover all that they need to know on your chosen topic, so that they don’t have to look for any other resources. And very importantly, it shouldn’t try to sell anything. Still building trust with prospects? Teach, don’t sell. You’d trust a teacher before a salesperson. An email to invite subscribers to sign up for the course: Be as specific as possible about what you’ll teach your leads and what they should expect. The more targeted your course is, the more qualified leads you’ll attract. 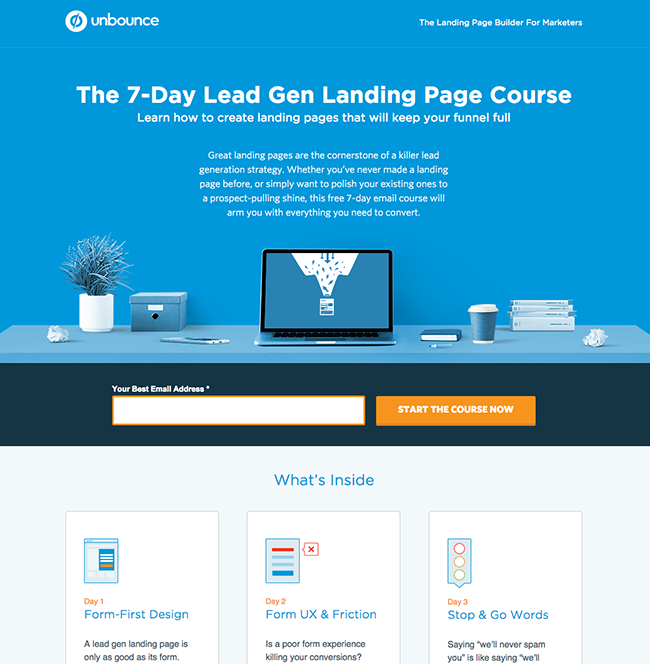 Landing page for the Seven-Day Lead Gen Landing Page Course. Click for full landing page. A complete guide about the topic, written in the form of daily lessons. While many guides are delivered in PDF form, an email course allows you to deliver smaller, more digestible pieces of content — even for people reading on mobile. An email template for the lessons. Be sure to keep the branding consistent with your registration landing page so that prospects will remember why they’re receiving the emails. 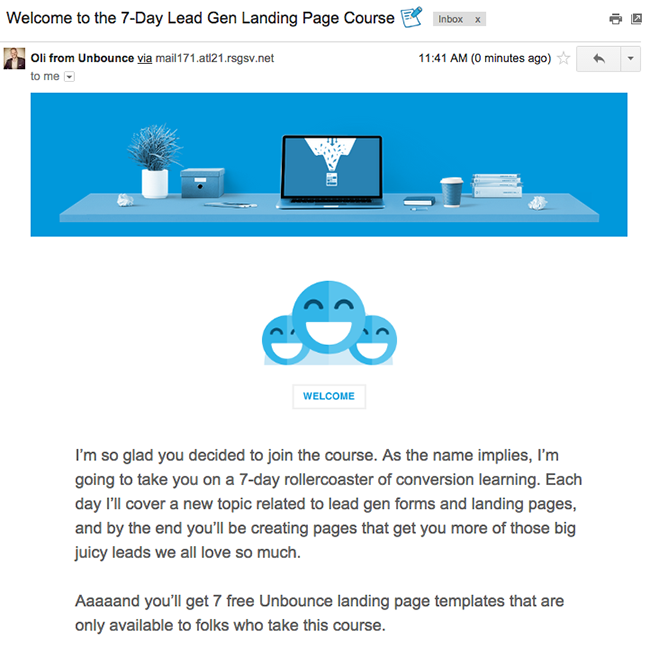 Welcome email for the Seven-Day Lead Gen Landing Page Course. Notice how the design matches that of the registration landing page? Keep your daily lessons short so leads can consume the information quickly – thereby getting a ton of value out of it. Just remember to keep self-promotional speak to a minimum and restrict any product pitch to the very end – the goal of this campaign is to educate people. As soon as they are aware of your level of expertise and your will to share knowledge, they will become more open to other useful things you introduce, and become a more engaged lead. Have registered for many content pieces and are actively engaged with your brand. Have developed a fair amount of trust in your brand, but also considering other companies. Have not purchased because their company is not ready for your product, or because they haven’t decided. You know these leads have some special interest in your brand, but something is holding them back: maybe they don’t have the budget, or don’t yet have the approval of their bosses. Maybe the time isn’t right. They trust you, but they need something to affirm that they need your product. Don’t wait for these leads to find more great information about you. Tell them by sharing customer success stories. Hop on the phone with current customers, add a survey widget to your site or reach out to them via email to find the data you need. Don’t wait for leads to find more info about you. Show them how great you are with case studies! Case studies and reports showing trustworthy calculations and industry figures. This’ll help leads who still need to convince bosses and decision-makers. Customer success stories from companies that are similar to your leads’ (in company size or industry), or that face similar problems (the ones that your company solves). A set of emails that you can send out to tell your customer success stories and inspire leads to try your product. An intimate understanding of your leads’ demographic, interests and biggest pain points. The more data you have, the more granular you can get in delivering a case study that fits their persona and truly resonates with them. Customer success management platform Totango goes as far as organizing an annual customer success summit, which allows their customers to share their own success stories and spread the good word. But if you’re not up for organizing events, sharing stories and data via email is a great start. For subscribers who are used to receiving information from you, you need to make the leap from sending general content to specific case studies as smooth as possible. Try framing the case studies as lessons learned from the customer community, with tons of action items. This type of content will help educate recipients and subtly nurture them towards a buying decision. Used to be interested in your content but hasn’t engaged with it in the last six months. Signed up for a free trial but then cancelled. Is unqualified and was returned to marketing by your sales team (only to be forgotten). This type of prospect has proven that they’re interested in what you’ve got; they might just need a gentle nudge toward conversion. This “nudge” could take the form of a promotion or discount offer – something to spruce up your offer and add a tinge of urgency. 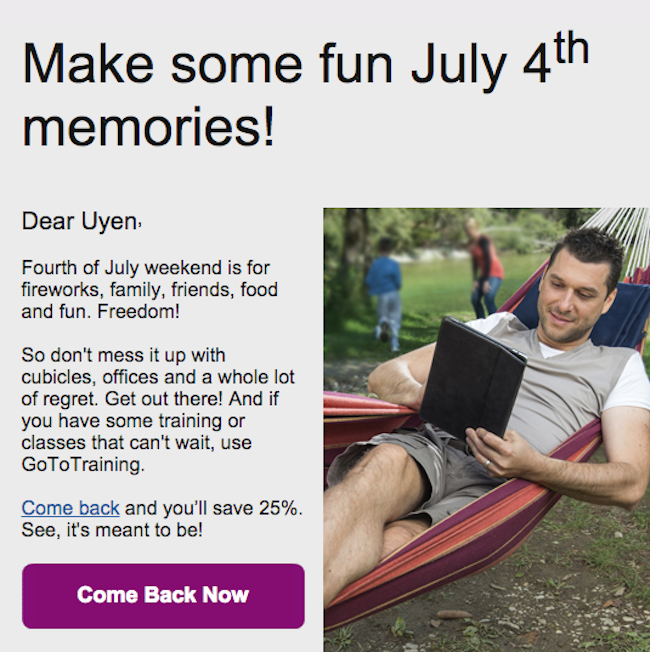 One of the emails Citrix sent us last year, and an example of hard-to-resist offers. A hard-to-resist offer that will push unsure prospects over the edge to convert. Also, don’t forget to give these prospects a clear opt out. If they’re not interested in your product after you try to re engage them, then ask them clearly if they would like to remain on your mailing list. Some people will naturally lose interest, and that’s okay. Some leads just aren’t meant to be. Give prospects a clear way to opt out. You don’t want to risk them hitting that spam button. Every lead nurturing campaign needs a clear target audience and a goal. Without these, you risk sending irrelevant offers to leads at early stages and losing their interest further down the funnel. If you don’t yet have a lead nurturing program in place, these four recipes will help you start sending people smoothly down the funnel – toward a happy and long-lasting relationship with you. Over to you – what are your favorite lead nurturing recipes? Steven Moody is the founder and CEO of Beachhead.io, a marketing consultancy and revenue technology incubator. Connect with him on Twitter at @sjmoody. For more lead nurturing ideas, get the Lead Nurturing cookbook.